The executive order applies to both nonviolent and violent former offenders. camera (Mark Gormus /Richmond Times-Dispatch/AP Photo ) Terry McAuliffe holds up the order he signed to restore rights to felons in Virginia at the Capitol in Richmond, Virginia, April 22, 2016. 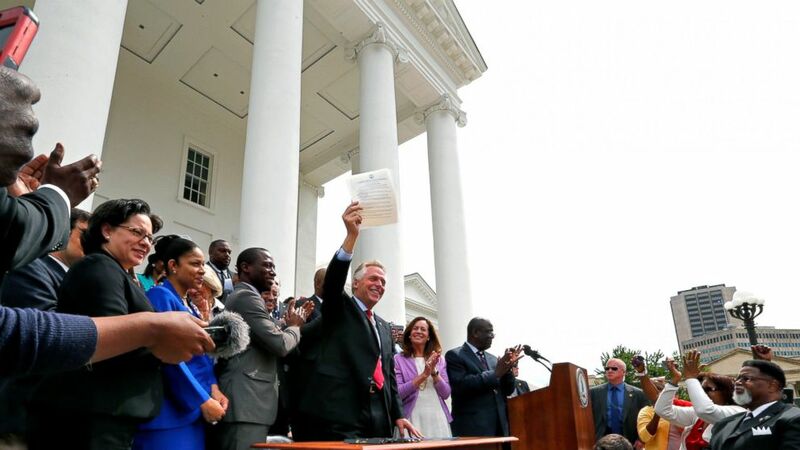 The governor of Virginia announced today that more than 200,000 people convicted of felonies will now be eligible to vote in the state after he signed an executive order restoring their civil rights. The order applies to both nonviolent and violent former offenders, but only after they complete their sentence and all other requirements like supervised probation or parole. The 206,000 people the governor's office says are now eligible to vote could influence how Virginia votes in the competitive 2016 election. The Republican Party of Virginia quickly criticized Gov. Terry McAuliffe’s decision to include violent offenders under the order, calling it “political opportunism” and a “transparent effort to win votes” for Democrats. The speaker of the Virginia House even said in a statement that McAuliffe made the decision to help elect Hillary Clinton, whom he has campaigned for in the current race. But McAuliffe told ABC News the decision has nothing to do with the election and that he thought it was the right thing to do as governor. “Forget the elections, as governor I’ve got to make decisions that are the best interest I believe for the Commonwealth. It was morally the right thing to do and legally I have the right to do it,” he said. Virginia was one of three states where felons and ex-felons permanently lost their right to vote, according to the National Conference of State Legislatures. McAuliffe said that today’s decision was also part of ending racial injustices that have existed since the Virginia Constitution was enacted in 1902. The executive order signed todaydoes not automatically apply to all individuals convicted of a felony in the future but McAuliffe ordered a similar order prepared every month as the Commonwealth continues to look at the eligibility process. The governor has restored the rights of 18,000 convicted felons in previous years, more than the past seven governors combined, according to a press release from his office.